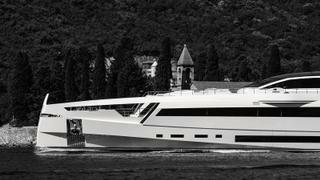 “The request was for a 50 metre speedboat,” says Fulvio De Simoni, exterior designer of Aurora. 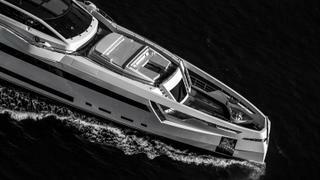 The 49.9 metre Rossinavi can hit a respectable 21 knots at half load, but the “speedboat” aspect is really all about its lean low lines, sloping coachroof and muscular accents. More significantly, this is a boat built for an owner in his 30s who shredded the rule book to create something for the style in which he — and perhaps many younger owners — now live. 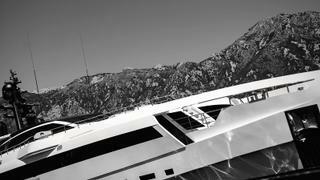 Take a closer look at the Rossinavi superyacht Aurora. Photography courtesy of Tom van Oossanen and Paolo Petrignani. 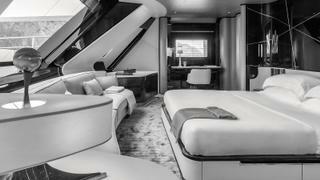 The owner had seen and admired the 48.28 metre, 2014 Rossinavi Polaris, an Enrico Gobbi design notable for its unconventional exterior spaces — including a 120 square metre flybridge deck with a waterfall, plus a sprawling foredeck lounge — and, less glamorously but also impressively, for packing in a spacious interior that slides in under the 500GT threshold (at which tougher regulations come into play). This owner was looking for “unique conceptual characteristics”, as Federico Rossi, Rossinavi’s COO, puts it, in a sub-500GT package, and he knew the Italian yard could deliver. The “offset bridges” approach involved compensating for the extra space eaten up by the client’s major request. The superyacht beach club is certainly outsized for a yacht of this length, with a high ceiling, good-sized sauna and head to port, and a rather special audiovisual system, which incorporates a huge interactive screen at the forward end of the beach club with sensors to detect and react to movement. It can be used as a cinema, to play video games or it can stream footage being recorded in real time by a camera installed in a stainless steel insert right at the tip of the bow. Rossi calls it “Aurora’s weapon”, adding that it was inspired by a detail from the world of Marvel comics. Right in the centre of the insert is a “high-resolution camera that projects the navigation to the LED wall in the beach club”. But as impressive as Aurora’s beach club is, it’s the knock-on effect a level up that really turns heads. Up the stairways that flank the beach club is a raised sunbathing area, and forward you descend to an al fresco dining area that is covered but with open sides. This approach allows for a tall beach club, without the need to raise the level of the whole main deck (and thus the gross tonnage) to accommodate it. 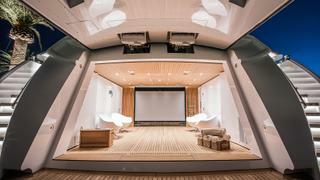 It’s more than an elegant solution: there is an evolution towards indoor/outdoor spaces within the conventions of yacht design — enlarging doors to the aft deck, ever-larger balconies, décor that unites interior and exterior — but these half decks are an example of genuinely innovative thinking, which has resulted in a truly hybrid space. 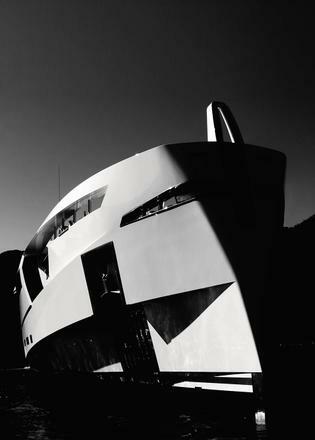 “The idea was also to have a space open to the sea with the right design to protect guests from view while the boat was in port [in contrast to most cockpits],” adds De Simoni. But some of Aurora’s most impressive attributes sit outside the gross tonnage measurement anyway. 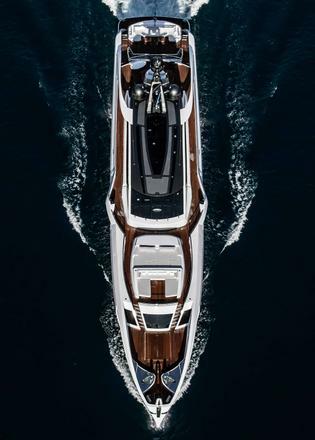 The foredeck — another exterior space protected from strangers’ gazes in port — features its own cascade of decks, with a broad sunpad lounge at upper deck level, then stairs forward that lead down to a space in the nose of the bow. 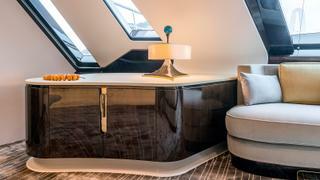 Guests could sip cocktails in the upper area out of view of crew using mooring equipment in the lower level — but side cut-outs in the latter space also make it pretty enough to be used as a social spot. It is a well thought through space, with touches such as protective glass panes over the electrical control panels, plus a thorough interactive digital monitoring system. And, as well as that impressive top speed, Aurora’s engines offer a 3,800 nautical mile range at 12 knots. 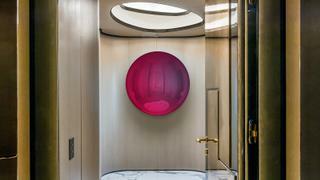 The central theme is that of a wave — “soft, calm and gentle,” he says — and considering the interior spaces were largely set when Salvagni got to work, it is impressive how much he has made them his own. The walls of the full beam saloon undulate organically — the effect enhanced by custom Cantalupi spotlights. 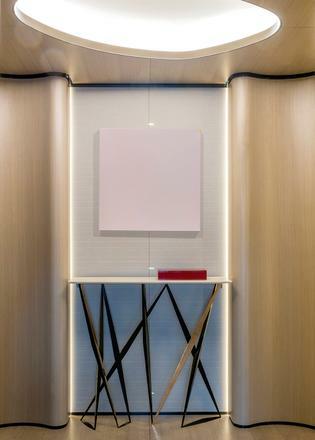 Here, their limed oak surfaces have been treated to feel like velvet, while forward in Aurora’s guest lobby the wave walls are a glamorous glossy tineo, a eucalyptus species that Salvagni describes as “not aggressive like ebony and not boring like wenge — something in between”. Woods are used to create a calming, cocoon-like feeling, either wrought in organic shapes on overheads, in furniture or as a cohesive tool. “You have the ceiling, the floor and the wall all conceived with the same wood, so you have a sort of precious wooden box that is a much cosier environment than a lacquered ceiling and different floor, different walls,” says Salvagni. The sofas and armchairs at the aft end of the saloon are custom made by Salvagni’s studio to curving organic forms in jewel-toned velvets, while forward is a monolithic elliptical dining table. This ethos also filtered into vintage lamps, for example a mid-century Fontana Arte standard lamp in the saloon, and a 1920s table lamp in the forward master suite. These cabins are a pick and mix of delights. Guests are sequestered on the main and lower decks in a complex of four double cabins ranged around that glamorous lobby and stairwell. 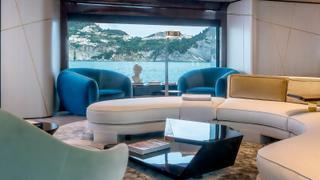 The crew cabins and galley are forward on the lower deck, with the captain further up, behind the superyacht wheelhouse. 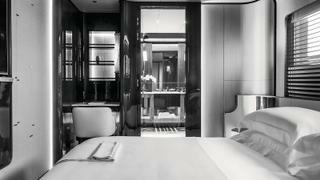 The guest cabins themselves are stylish nooks, with more undulating walls, that dark glossy lacquer contrasting pale velvety oak, as well as matt grey-veined marble and Devon & Devon taps in the en suites. 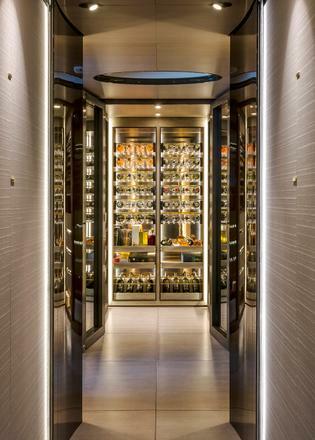 In the lobby on the main-deck level glints another of Aurora’s unusual delights — a glass-clad wine store as spectacular as a jewellery shop window. 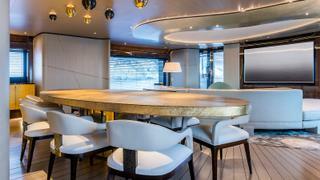 “The wine cellar turned out to be the heart of the yacht,” says Salvagni. 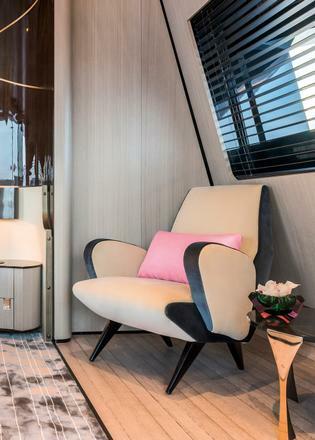 There are two master suites on board and both are unusual: a light and airy one on the upper deck aft, where an upper saloon more commonly lies, the cabin opening up on to a broad private terrace; and the other forward of the guest cabins on the main deck. The cosy cabin of this space is fronted by huge windows that are part of the same sloping flank that serves the wheelhouse on the level above. 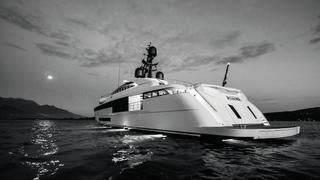 “I was aiming to give the owner’s cabin a forward view, to see where the boat was going,” says De Simoni. It’s certainly clear where Aurora is going. Now let’s see if others follow. First published in the December 2017 edition of Boat International.